I can hear the rain pounding on the roof of the make-shift, open air laboratory. Everyone on screen wears some type of fluorescent rain gear. Jim Seeland, a member of the UAS Fish Tech faculty, and I are watching a video in his office. He points out his six students. It’s a rainy day in Anchorage, and the students are outside learning from Fish and Game experts at the hatchery’s egg take station. One student holds a mature Coho awkwardly against her thighs. A bright white liquid squirts into a small cup. “That’s the milt,” Seeland explains—the seminal fluid, for those of us less familiar with fish reproduction. “It may look slow and tedious, and you’ll see people are standing around,” Seeland explains, “but that’s only because they’ve never done it before.” The camera turns to the right, and another student massages translucent orange eggs out of a female fish. This October, Seeland met up with students in Anchorage to take part in a hands-on orientation with Alaska’s fisheries. FT S230 Alaska Salmon Culture Lab gives Seeland’s students, who are primarily distance students, the chance to interact with their professor, current culturists, managers, and technicians, in addition to the fish, of course, face to face. While students come in with a strong understanding of the science of fisheries from distance coursework, the lab offers them the chance to actually do stuff. It gives them a taste for the careers that are available and what those careers would entail. 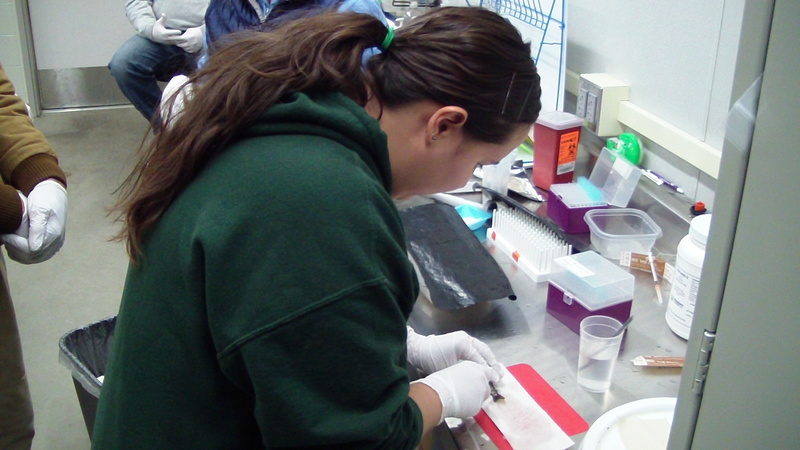 Every fall for a number of years, the lab course has been offered in Sitka. The three day Sitka based course, which will run later this month, introduces students to the three privately owned hatcheries in town. This is the first year the lab has been offered in an alternative location. 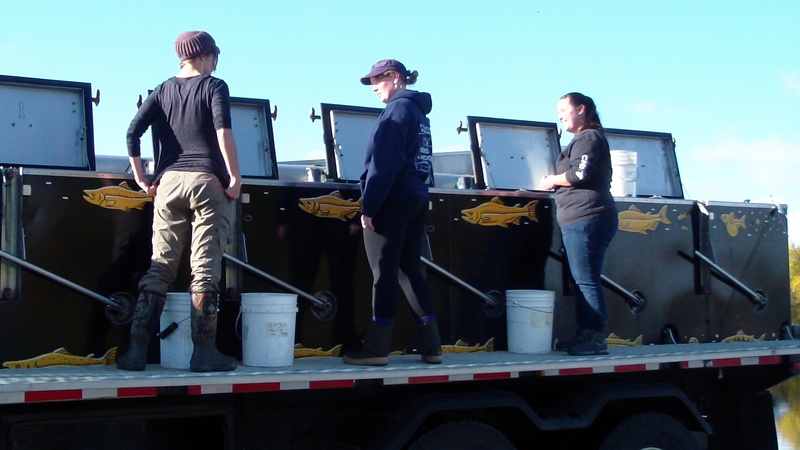 Fish Tech students help collect salmon eggs for fertilization. As many Fish Tech students live near Anchorage, UAS Fish Tech saw an opportunity to bring the curriculum to the students. “It’s less expensive to send us to them, rather than have them come to us,” Seeland explains. Seeland understands that many of his students have families, and full time jobs. “We’re always thinking about how to make our courses more affordable to students,” says Seeland. Adding hands-on lab opportunities closer to where students live and work reduces stress and financial burdens. “Our program is flexible, and dynamic,” Seeland says. 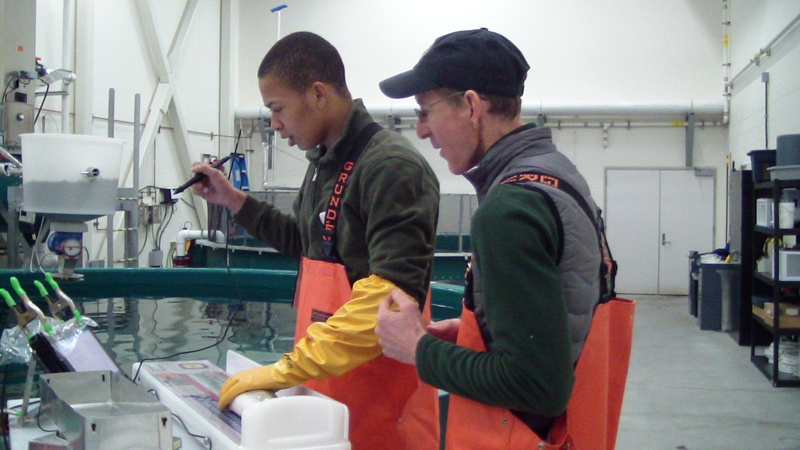 Beyond making the course more accessible, the Anchorage based lab course exposes students to a highly advanced fisheries operation. Built in 2011, the William Jack Hernandez hatchery rears Coho, Rainbow Trout, Chinook, and Arctic Char. The hatchery performs all the typical fish culture functions one would see at hatcheries across Alaska, but is comparatively cutting edge. “What the students saw doesn’t completely represent the way the rest of Alaska works,” Seeland explains. Through their visit, students were exposed to the nuts and bolts of fish culture practices, but it also gave them a picture of what the industry will look like in the future. They are already one step ahead. Fish Tech students help ADF&W stock a lake in Anchorage. As one example, the majority of the water used in the facility is recycled to reduce waste and energy costs. A sophisticated treatment system clears fish byproducts from water from the facility’s 100 rearing tanks. It’s imperative that workers know how the system works, and therefore how to troubleshoot. Seeland’s students examined the system step by step, from the removal of suspended solids, to biofiltration—the final step to remove any microscopic bacteria or pathogens. “While it seems like water resources in Alaska are endless, they won’t be available in the future,” Seeland explains. “More and more frequently, we’re having to make whatever resources we have stretch further and further.” The knowledge the students gained will prove beneficial, especially in light of depleting water resources worldwide. “It was a blast the entire time,” recalls Iris Fletcher, a distance Fish Tech student at UAS. Fletcher felt like the lab complemented the lectures well, and exposed aspects of working in the industry that could not be learned in a classroom. 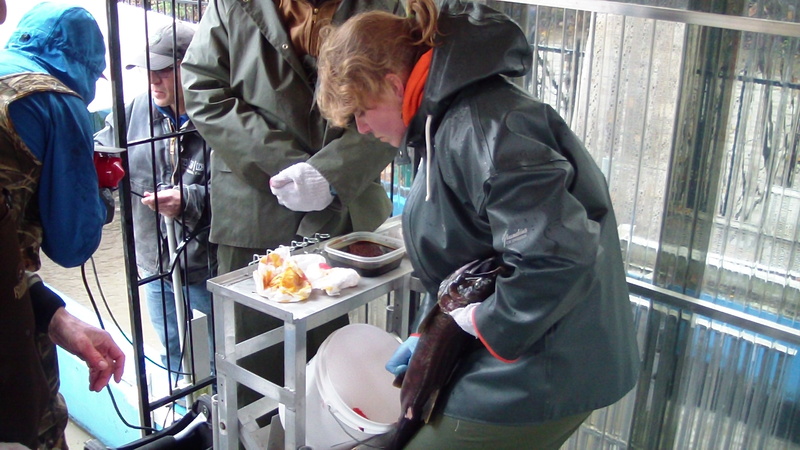 “We didn’t just tour the facility, we got to work with hatchery members to help them with what they were doing.” She admits, “a lot was just cleaning, but that is the nitty gritty of working in a hatchery.” Seeland and Fletcher both agree, it was an authentic experience. Each day overflowed with activities and discussions. Students gained experience in the theory behind fish culture, maintenance of facilities, feeding systems, sampling procedures, and water quality monitoring. While they had been exposed to most of these concepts in a two-dimensional arena through distance courses with the University, the lab course offered a three-dimensional experience. Fish tech students help extract DNA from sample fish. “Stocking was my favorite part,” says Fletcher. “We got to be a part of the process, but we also got to see how Fish and Game interacts with the public.” Inevitably, a giant tube hurling hundreds of flopping fish into the air draws the attention of the average passerby. The Fish Tech students learned the importance of understanding fish, but also the equally important skill of interacting with people. “That’s what I’m really interested in, fisheries and education,” Fletcher explains. While Fletcher’s ideal job would involve working outside, after this experience, she is more open to the possibility of working for a hatchery. “It would be fun…, even though it’s not field work,” Fletcher says. Seeland hopes that labs like this, in addition to internships, will connect students to industry partners, including the Fish and Wildlife Service, Alaska Department of Fish and Game, and a number of private organizations. These introductions will help students down the road when they’re looking for positions. “Jobs are available,” he says. Being able to say, ‘yes, I’ve helped spawn salmon at a hatchery,’ puts students ahead in the job market. Furthermore, programs such at this bring the Fish Tech department at UAS into the conversation at organizations like Fish and Game, and promote collaboration in the future. Adding the option to take the Salmon Culture Lab in Anchorage makes the course more accessible—geographically and financially. Seeland would ideally like to have a hands on experience available to every student, “if there are six or so students, we’ll send someone up there.” For the solo student in a rural area, Seeland hopes to at least be able to connect them to a hatchery in the neighborhood where they can observe, and participate in similar activities. 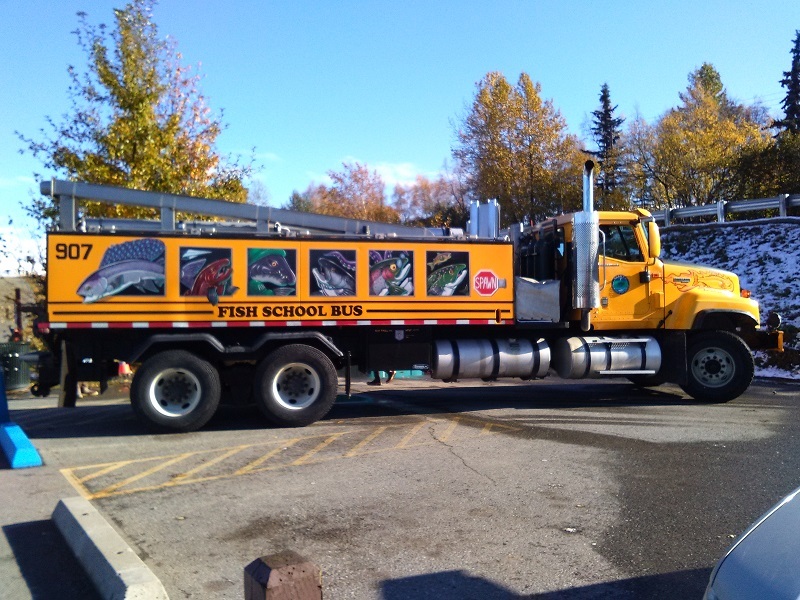 This fish school bus takes fish to lakes, rather than kids to school.